People pass by shops on a quiet Yoshidamachi-dori. On the right is a drug store (薬屋) advertising goodies like Chujoto women’s herbal supplement tea (中将湯), bedbug extermination (南京虫退治) and industrial use chemicals (工業用薬品). Sounds like a fun store to visit. Although quiet on this postcard, Yoshidamachi-dori was actually perfectly located and a popular street to go shopping. When Commodore Perry first arrived in Japan, Yokohama-mura was a quiet village not connected to the Tokaido, which at the time was still bustling with daimyo, their samurai and other travelers. In the eyes of the Tokugawa government, this remoteness made Yokohama an ideal location to place foreigners, worried as they were about them clashing with samurai. Within no time a road was built from Kanagawa-juku, the nearest station on the Tokaido, to Yokohama. Where the road crossed the Yoshida River, a bridge was built and quite appropriately named Yoshidabashi (Yoshida Bridge). Yoshidabashi was guarded by a checkpoint, Kanmon in Japanese. The area guarded by the Kanmon, and therefore “inside” the Kanmon, was called Kannai, the area “outside”, Kangai. Foreigners moved into Kannai and Japanese lived mainly in Kangai. In 1860, the Japanese authorities built canals to completely surround Kannai by water, uncomfortably reminding many of the foreigners there of the situation in Nagasaki‘s Deshima. For some two centuries the Dutch traders who lived on that tiny island in the bay of Nagasaki had not been allowed to leave its confines. Over the years, restrictions were eased and streets nearby Yoshidabashi became attractive locations for shops, theaters, restaurants and other businesses. These in their turn attracted bustling crowds. 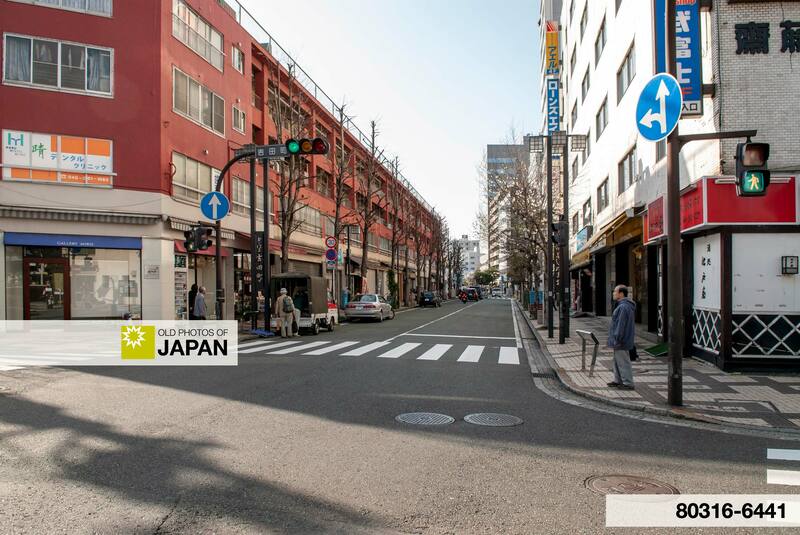 Especially popular were Isezakicho-dori, known among foreigners as Theater Street and Yoshidamachi-dori. 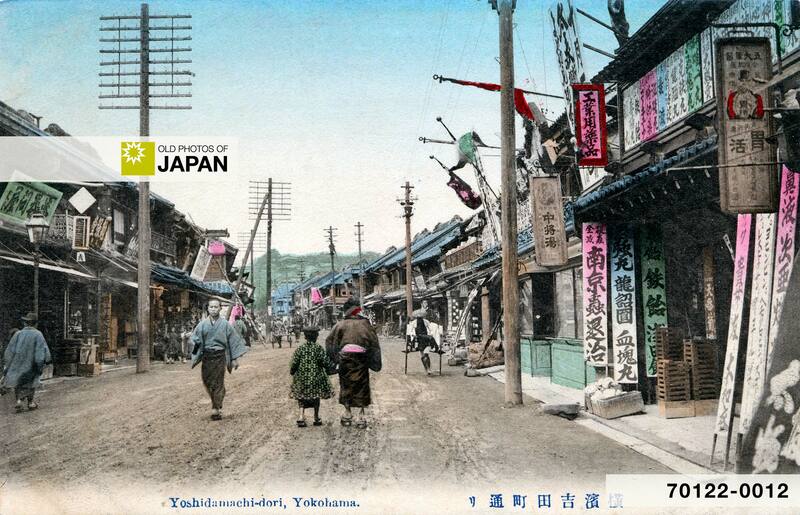 Like Isezakicho, Yoshidamachi was repeatedly destroyed by disasters and war and always rebuilt. The street exists to this day, but it has lost its disorderly charm and ambiance as well as its enthralling drug store. 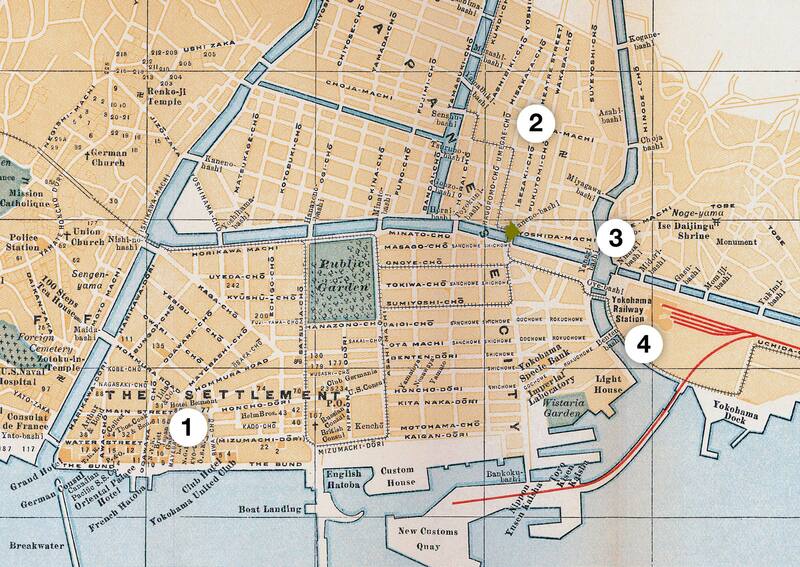 1890 (Meiji 23) Map of Yokohama: 1. Isezakicho-dori; 2. Yoshidamachi-dori; 3. Miyakobashi; 4. Nogemachi-dori; 5. Yoshidabashi; 6. Yanagibashi; 7. Nishikibashi; 8. Oebashi; 9. Yokohama Station; 10. Bashamichi; 11. Bentenbashi. You can also licence this image online: 70122-0012 @ MeijiShowa.com.